The absence of President Muhammadu Buhari at the burial of 19 soldiers, who were among the victims of Boko Haram ’ s attack on a military base in Metele, Borno State , has become another subject of conflict between the Presidency and the presidential candidate of the Peoples Democratic Party , Alhaji Atiku Abubakar . While Atiku had, on Saturday , berated Buhari for his absence at the burial of the soldiers , whose remains were interred on Friday in Maiduguri, the Presidency reminded the former vice president that Buhari had done better than him by visiting the soldiers after the attack . It reminded Atiku that as vice president to Olusegun Obasanjo in 2001 , he did not visit the troops after scores of soldiers were killed in Zaki Biam in Benue State . In a statement , Atiku advised Buhari to emulate French President Emmanuel Macron on how to bury heroic soldiers. The PDP presidential candidate lamented that it was sad that neither Buhari nor Vice President Yemi Osinbajo attended the funeral of the military men who were killed in Metele during the terror attack . Atiku stated that it was also worrisome that the Federal Government did not send a high - powered delegation to represent the government at the funeral . He said , “ This is sad and totally unacceptable . This is beyond politics . This touches our shared humanity . What would it cost (for) the President to take a day and fulfil his role as head of state by attending the funeral of such men of honour and valour? “ I urge President Muhammadu Buhari to learn from French President Emmanuel Macron , who , on March 28, 2018 , took a whole day off to attend the funeral of Lt. Col . Arnaud Beltrame, who was killed by a terrorist after a March 24 , 2018 terror attack on the South of France . Atiku believed it was more worrisome that Buhari took time out of his busy schedule to host Nollywood stars at the Presidential Villa but could not attend the funeral . But the Presidency recalled that the President condoled with the government and people of Borno State and also visited wounded soldiers , who were recuperating in the hospital after the Metele tragedy. The Presidency noted that by visiting Borno State and the wounded soldiers , Buhari had demonstrated enough leadership . It stated in its reaction on Saturday , “ The loss of the gallant soldiers, as President Buhari has said , is a national loss, on account of which he went to Maiduguri where he condoled with the government and people of Borno State , addressed the troops at Maimalari Barracks as well as visited the convalescing gallant soldiers. The Presidency drew a comparison with a similar incident that occurred in 2001 when Atiku was the vice-president to Obasanjo , saying neither of them showed any concern when troops were killed in Benue State . 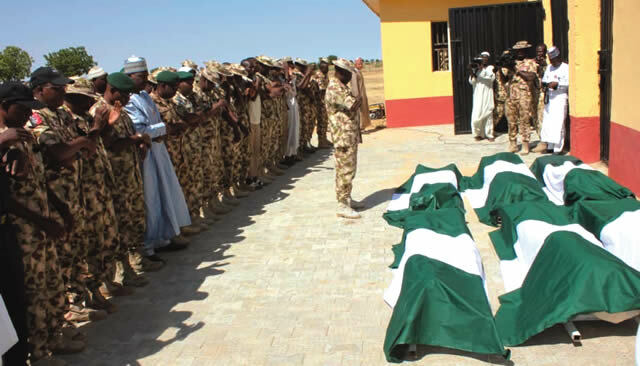 It stated , “On the other hand , however, when a similar number of troops ( 19 soldiers) were abducted and killed in October 2001, neither he (Atiku Abubakar ) nor his boss , President Olusegun Obasanjo , paid any tributes , not to talk of visiting the grieving family members of the martyred soldiers.